I have been a fan of Jonathan Adler's pottery since I saw his wares at Barney's New York in early 1990s. I always thought his stuff are witty and stylish at the same time. Not sure if he got his break at Barney's because his bf worked at Barney's window dressing department, or if he got into the Chelsea Passage (Barney's home department) on his own merit. Either way, I'm glad he was discovered because the world of interiors can certainly use a dash of Jonathan Adler. Some of my favorite pieces by Jonathan Adler are his lamps; specifically his animal lamps. I remember the first time I saw the giraffe lamp I thought to myself "if I have thought of designing a giraffe lamp, that's exactly how I would execute it." The head as a finial of a lamp was just brilliant. Although I would have to say depending on the animal, this particular collection of lamps can verge on children's room theme (which isn't bad... just limited). 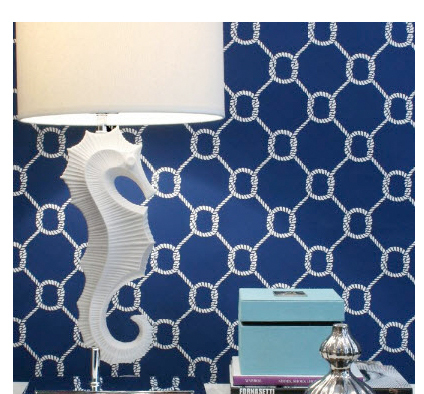 One of the more versatile lamp within this collection is the seahorse lamp. I can see this lamp being prominently displayed at a beach house or a beach house theme home. The polished nickel base adds a bit of reflective quality and elegance to an interior space. I can see a pair of these going behind a sofa on a sofa table or on a foyer table near front door. And best of all is I have a 20% off coupon for you! Between November 9-11, enter FF2012 when checking out to receive the discount on his website.